You may see London, you may see France, but in Flint, Michigan, you won't see underpants. Police are cracking down, sending out notice that they will begin making arrests for those wearing saggy pants. 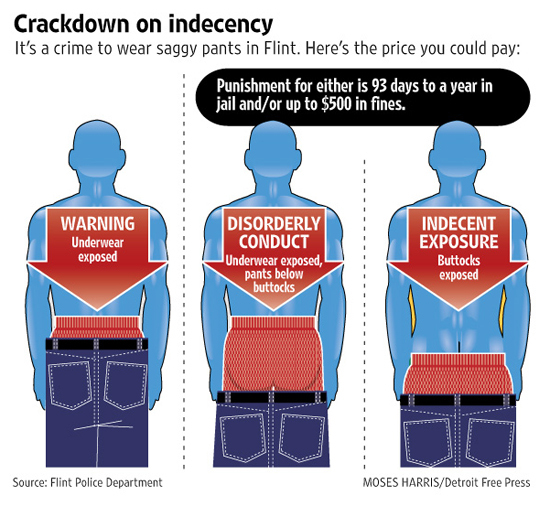 Pants pulled completely below the buttocks with underwear showing is disorderly conduct; saggy pants with skin of the buttocks showing is indecent exposure, and saggy pants, not completely below the buttocks, with underwear exposed results in a warning.